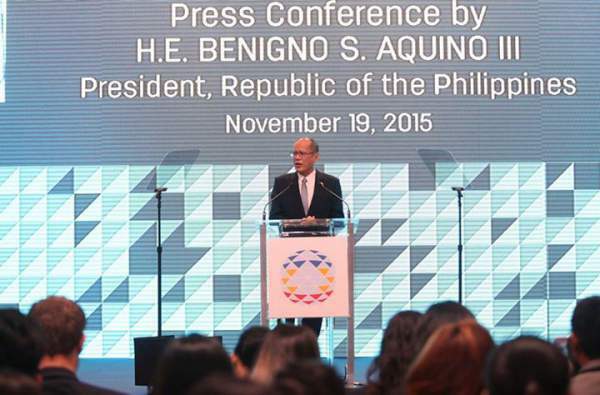 SPEECH: President Aquino at the conclusion of the APEC Economic Leaders' meeting on November 19, 2015 - Balita Boss! Below is the statement given by President Benigno Simeone Aquino III, the Chair of this year's Asia-Pacific Economic Cooperation, during the press conference at the International Media Center at the World Trade Center, Pasay City on November 19, 2015. It has been 19 years since the Philippines last hosted APEC. Back then, we led the setting of concrete steps to open up our economies in line with the Bogor Goals. This year, I am proud to have continued our success as hosts by laying the foundations on which APEC can chart a course to improve trade and strengthen quality growth. I thank my fellow APEC Leaders for their collaborative efforts and positive spirit as we worked together towards the goals that we share, and our cooperation gives us optimism that we can achieve greater progress sooner rather than later. These past couple of days, we discussed the critical regional and global issues we face as one Asia-Pacific region. If past APEC meetings were highly technical discussions on trade issues, the discussions over the past couple of days have taken a broader approach. We have sought to address the challenges presented by the ever-changing global economic milieu. For instance, we shared ideas on how to encourage technological innovation, while at the same time easing its disruptive effects on the job market by giving rise to more resilient economies. We have likewise been able to exchange ideas on how to foster greater inclusivity in our economies. Since inclusive growth has always been the guiding principle of our administration, we are proud to have put this approach front and center throughout our hosting APEC this year. Throughout the year, representatives from all member economies held 229 meetings to advance our individual economies and the region at large. During this time, we have seen our locales lend their names to strategies that will help empower small and medium enterprises, among others. There is, for instance, the Boracay Action Agenda, which will help micro, small, and medium enterprises access the global and regional markets. Complementing this is the Cebu Action Plan, which will widen entrepreneurial access to financial markets. Among its other benefits will be lowering the cost of remittances. Apart from this, our representatives also finalized the Renewed APEC Agenda for Structural Reform, which will guide economies on which areas they need to reform to achieve sustained growth; as well as the Disaster Risk Reduction Framework, which recognizes the impact of climate change on our region. This framework aims to minimize losses and promote best practices so that we can build back better. At today’s APEC Economic Leaders’ Meeting, we agreed on the overarching frameworks under which we will pursue these plans. First, we adopted the APEC Strategy for Strengthening Quality Growth. This is a framework that will guide us in undertaking robust, comprehensive, and ambitious structural reforms over the next five years. We will focus our reform efforts, and measure our progress, in terms of institution building, social cohesion, and environmental impact. We do this with the awareness that the world economy continues to confront significant risk and uncertainty, even as trade growth is slowing down, thus impressing upon all of us, the need to tap into new opportunities for economic growth. This strategy will help APEC promote increased growth through structural reform. Second, the Leaders approved the APEC Services Cooperation Framework. The services sector is becoming a more important part of the economic equation. It makes up approximately two-thirds of the GDP in the APEC region, and we need to put more emphasis and thought into making this sector even more competitive. This Framework will lead to a goal-driven roadmap for us to achieve over the next decade, to help the sector thrive. To make the most of this gathering, the Philippines, for its part, took the opportunity to meet with leaders of economies, as well as leaders in the private sector, who had gathered here in Manila. We have taken existing partnerships to a new level. With Mexico, for instance, we committed to work together to combat drug trafficking, which is a common concern of our peoples. With Papua New Guinea, we offered our assistance in supporting their agriculture sector. It was also during this week that we formalized our strategic partnership with Vietnam and our comprehensive partnership with Australia. Moving forward, the areas in which we will work more closely together include defense, disaster risk reduction, and food security. We also engaged in dialogue with the Pacific Alliance, which is timely, given their high growth potential and ours. A number of leaders also expressed their support for the Philippines joining the Trans-Pacific Partnership, once it comes into force. This is a very encouraging sign; we of course want to join the TPP because it offers access to a far larger market. The USA and Australia, among other economies, expressed their support for this particular endeavor. Apart from that, we were also pleased to hear the news that the USA would be turning over to the Philippines a research vessel and a coast guard cutter which will boost the capabilities of our Navy. Over the past week, we welcomed more than 11,000 people to our country, including those from the APEC Business Advisory Council, which, by the way, traces its origins to the APEC Summit in Subic in 1996 in the Philippines. This number is more than double the attendance of our previous hosting. In fact, when we said yes to hosting, it was with the expectation that all the facilities in construction at the time—both public and private—would be finished by the time we had to welcome our guests. Apart from the fact that, as a general rule, each one of these visitors creates one new job for us; they have also now seen our country and met our people. In other words, they have discovered that the Philippines not only works, but it is indeed more fun. Our theme for APEC 2015 has been “Building Inclusive Economies, Building a Better World.” By balancing the discussions in APEC between the technical aspects of trade, and its implications on the social and environmental challenges of growth, we have refocused our discussions towards all our people—the ones whose lives we, as leaders, are pledged to improve. For all these successes, I thank all those who worked tirelessly to make this event possible. Most importantly, I am grateful to our countrymen who have expressed their support for our hosting. All my fellow leaders heaped praise on how our people have welcomed them, and their words really made me swell up with pride. Truly, it is a singular honor to lead such a great people. I am certain that, with your continued support, there is absolutely no doubt that the Philippines will continue its progress for years, if not generations to come.